Or if you’re into using air quotes, this should be Eggplant “Lasagna” because it’s sneaky. “Lasagna” minus the lasagna noodles. This is a great recipe that I got from my friend Tim Macri. It’s extremely versatile and can morph into many different styles – traditional, vegetarian, gluten free, etc. You can make homemade sauce as I show here or you could shorten the prep time considerably with a good jar of your favorite sauce. Want more veggies? Layer them right in there! As I was making this I was already wishing for some fresh spinach and maybe some sautéed bell peppers. Think of this as your base recipe for eggplant goodness and let it fly from there. Eggplant, Onion, Mushrooms, Fresh Basil, Fresh Parsley, Garlic, Italian Sausage, Ricotta Cheese, Mozzarella Cheese, Romano Cheese, Tomato Puree, Tomato Sauce, Diced Tomatoes, Tomato Paste, Olive Oil, Dried Oregano, Dried Basil, Bay Leaf, Salt & Pepper. This sauce is my basic, go to red sauce with meat for every kind of pasta. My mom called it Mostaccioli sauce even though we usually ate it with penne pasta. She made hers with a combination of ground beef and Italian sausage. My love of sausage has been well documented here so it should come as no surprise to anyone that I ditched the beef in favor of more sausage. Grab a huge pot. This makes a ton of sauce. You’ll have enough for the Eggplant Lasagna and also 2 more containers of about 4 servings each for freezing. Homemade pasta sauce is the best thing to have in your freezer for times when you are too busy to think about cooking. Heat 2 Tablespoons of olive oil in your big pot over medium high heat. 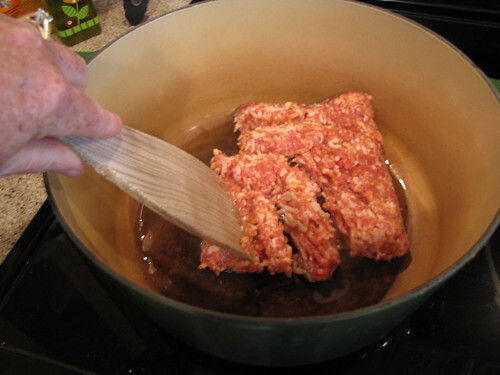 Add 1 to 1½ pounds of bulk Italian sausage and use a spoon or spatula to break it apart as it browns. 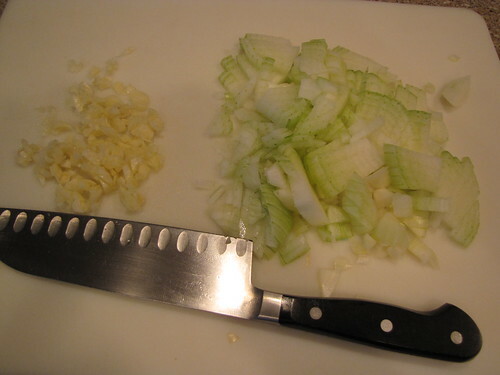 Finely chop 1 large onion and 4-5 cloves of garlic. 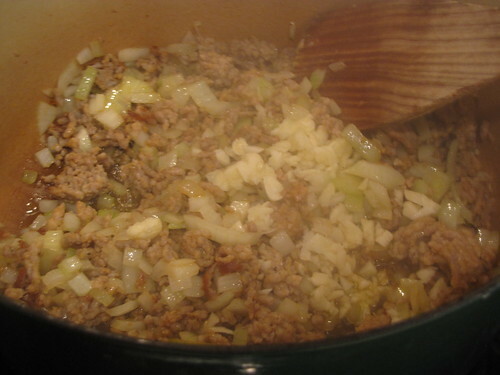 When the sausage is mostly browned, add the onions and garlic and sauté until soft and slightly golden, about 5 minutes. Add 3 (14.5 oz.) cans of diced tomatoes and their juices, 1 (28 oz.) can of tomato puree or crushed tomatoes (I use whichever one I have on hand), and 1 (15 oz.) can of tomato sauce. 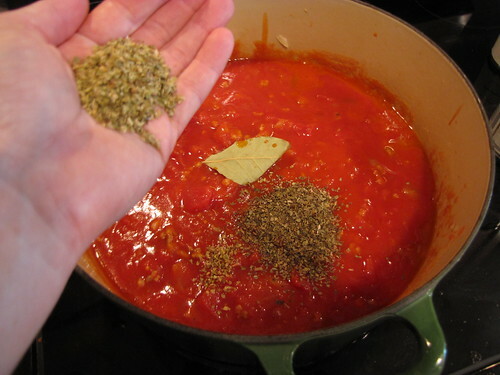 Season the sauce with 1 heaping Tablespoon of dried oregano, 1 heaping Tablespoon of dried basil, and 1 bay leaf. I don’t measure the herbs, just pour in a nice palmful. I often add more as the sauce cooks down. Season with salt and pepper to taste…for me that’s usually about 1 teaspoon of each. You can always add more later. Stir the sauce to combine, bring it to a boil, reduce the heat to low, cover with a lid, and simmer for 45-60 minutes. If you can simmer this even longer, it will taste even better. 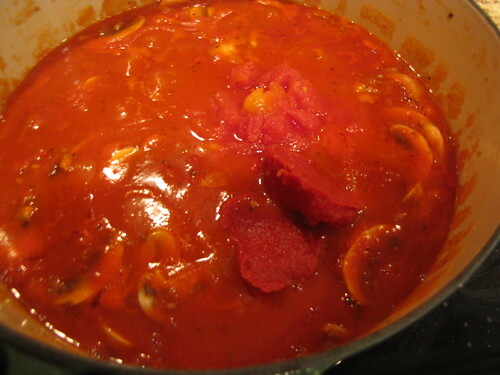 Once your sauce has simmered, slice 8 ounces of fresh mushrooms and add them to the pot. Continue to simmer the sauce 20-30 minutes more until the mushrooms are tender. 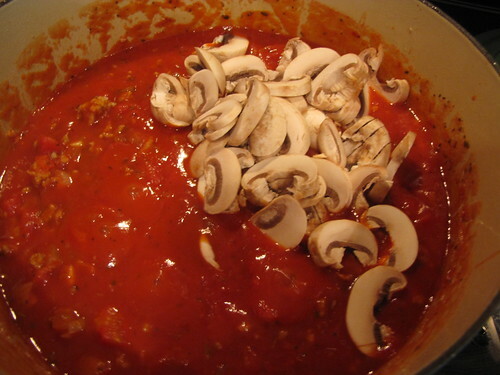 After the mushrooms have cooked, add 1 (6 oz.) can of tomato paste. Be sure the tomato paste is the last thing you add as it thickens the sauce up nicely but also tends to make it stick. Taste and adjust the seasonings and turn the heat to the lowest setting to keep the sauce warm. While the sauce cooks, you can prepare the eggplant. 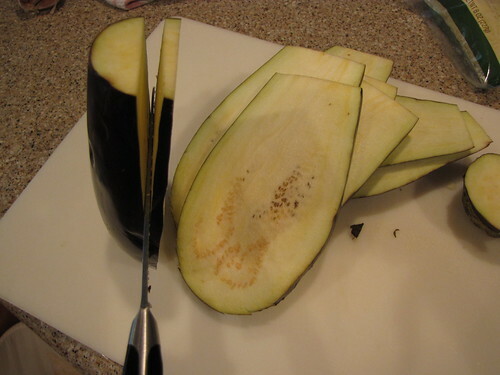 Remove the stem then cut a large eggplant vertically into thin slices only about 1/2 inch thick. You want about 10-12 slices of eggplant – enough to make 2 layers – so if you can’t find a good large eggplant, buy 2 smaller ones. Place the slices of eggplant on baking trays that have been lined with foil or parchment and oiled or sprayed with non-stick cooking spray. 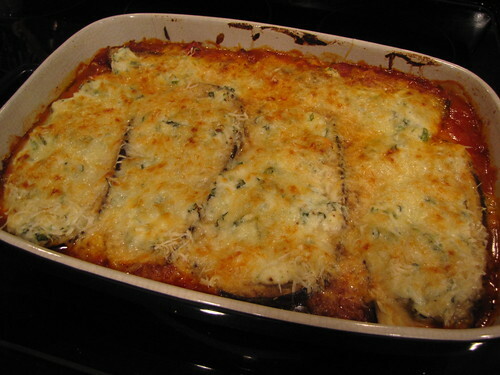 You will probably need to use 2 baking trays to accommodate all the eggplant without overcrowding it. 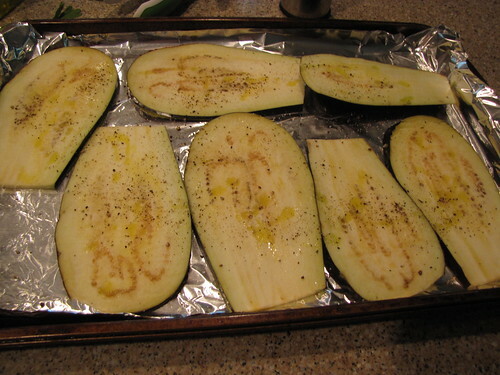 Drizzle the eggplant slices with a little olive oil and season lightly with salt & pepper. 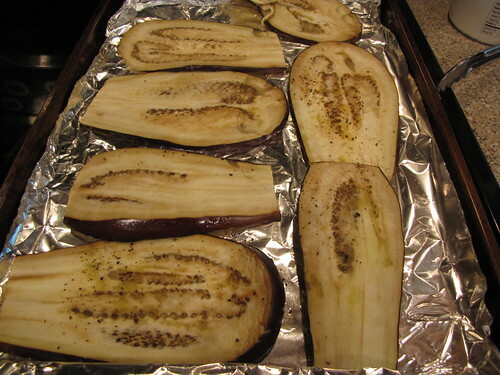 Bake or roast the eggplant at 400 degrees for 10-12 minutes until it is slightly soft and sort of wilted. Don’t over cook it or it will turn to mush. While the eggplant cooks, chop up a big bunch of fresh basil and fresh parsley. I have at least 1/2 cup of basil and about 1/4 cup of parsley. 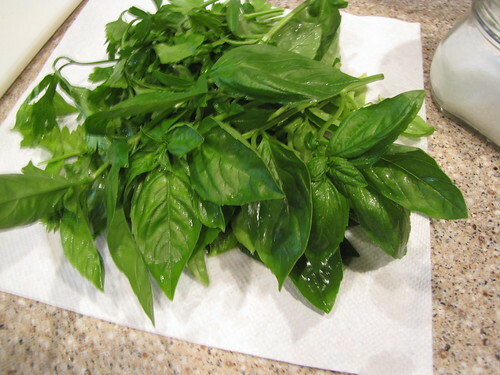 In my opinion, you really can’t have too much fresh basil. Ever. 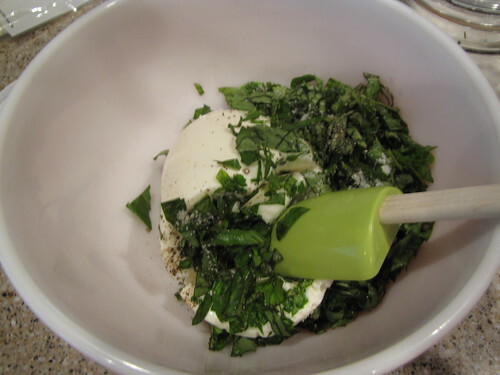 Combine the chopped basil and parsley in a bowl with 1 (15 oz.) container of ricotta cheese. I’m using light or lower fat ricotta but use whatever you like. Add a little salt & pepper and stir until smooth and well combined. 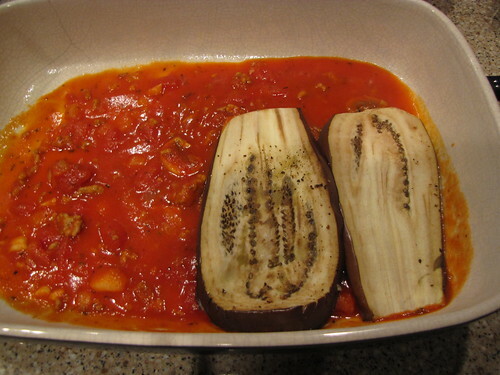 Rescue the roasted eggplant slices from the oven and reduce the temperature to 350 degrees. Time to build the lasagna. Grease or spray a large baking dish (mine is 9×13) with non-stick cooking spray. Spoon a thin layer of the sauce into the bottom of the pan and fit half of the eggplant slices into a single layer. It helps if you rotate the slices so they fit like puzzle pieces. 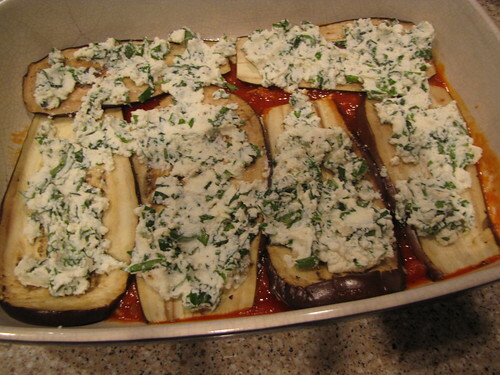 Spread half of the ricotta and herb mixture over the eggplant. I used my fingers to spread it out. It doesn’t have to be perfect or pretty. Add a layer of grated mozzarella cheese, about 3/4 cup, over the top. Add a second layer of meat sauce over the mozzarella cheese and continue to build a second layer of lasagna with the remaining eggplant pieces and remaining ricotta cheese. I like to end with a layer of sauce on top plus a topping of about 3/4 cup mozzarella and a nice sprinkling of grated Pecorino Romano. The romano gives it a nice nutty, sharp flavor and also helps the top get golden brown. There’s no real hard and fast method to the layers. 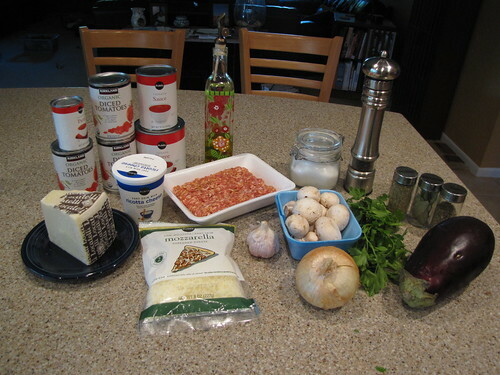 Just try to spread them out evenly sauce, eggplant, ricotta, mozzarella, sauce, eggplant, ricotta, mozzarella, etc. Cover the lasagna with foil and bake at 350 degrees for 20 minutes. Remove the foil and bake for an additional 30 minutes or until golden brown and bubbly. I like mine with a little extra crunchy golden topping so I run it under the broiler for just 1-2 minutes at the very end. 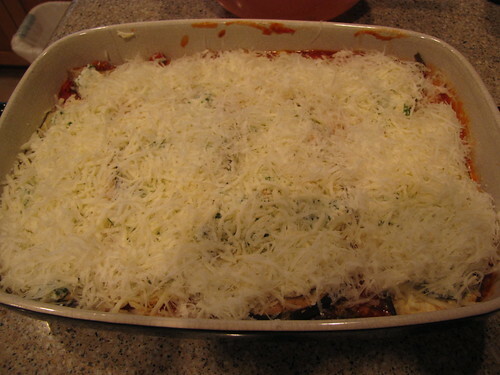 Allow the eggplant lasagna to rest in the pan for at least 5 minutes before cutting into servings. Garnish with a little extra fresh basil and serve. I LOVE this dish so much. I’m a huge eggplant fan so I knew I would love it but Jim, who usually needs a fairly high ratio of meat to vegetable, loved it as well. 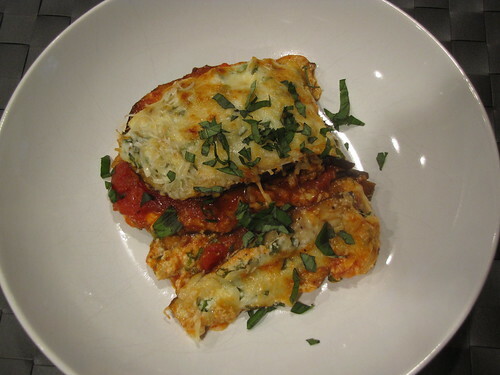 It’s a little like eggplant parmigiana meets lasagna. Plus it’s so rich and flavorful, you’ll never miss the extra layers of pasta. I’m also a huge fan of the eggplant!! This looks delish as well…..can’t wait to try it myself.